There’s a lot of material to get through in the advanced course. You’ve got the seven modes and the four arpeggios. There are seventeen technical exercises and not mention, fifteen acoustic songs! Worth noticing is the connection between all this and what you learned during your intermediate studies. A barre chord can easily be extended to a 7th note chord, all modes are built by adding notes to the pentatonic shapes you already know. The chromatic and sweeping exercises are developed by having more complex rhythms. You can preview all this material by following a link to each topic below. Arpeggios are quicker to learn and apply than the modes as there are only four of them, the maj7, dom7, min7 and min7b5. They look very similar to the barre chord shapes as well so you’re merely bridging a gap here between chord and scale. The advanced course takes these exercises all the way, there may only be four arpeggios to learn but you can do so much with them. Go to advanced arpeggios to see the video lessons. 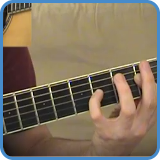 In the advanced course, you learn how to play the Ionian mode (the major scale) and how to extend all your barre chords into 7th note chords. On the advanced chord progression page, we pair these two concepts as we play each chord from every note of the major scale. These exercises will change the way you understand music and how it applies to the guitar fretboard. 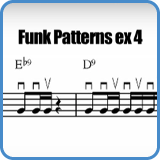 In the course, you get plenty of challenges playing these exercises using different rhythms and keys as well. Chordacus display all chords, modes, and arpeggios clearly all over the fretboard. You can use this software to help you as you practice any of the above. For example, all modes are practiced using the barre chord shape, the pentatonic and mode, in Chordacus these layers have different colors so you can visualize them easier. Go to advanced chordacus to find out how each mode is displayed in chordacus. 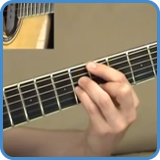 This page contain video lessons that demonstrate how to extend all your barre chord shapes to min7, maj7, dom7, and min7b5. To get the full picture you must practise these chord shapes all over the neck in every key. Since you can already play the shapes as triads after taking the intermediate course, it won’t take long to learn how to extend into seventh note chords. 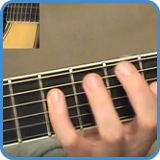 Go to advanced chords and find a video lesson for each and every chord shape. On this page, there are another seventeen variations on the chromatic and sweeping exercises. Practice these regularly and you will improve your pick control, sweep technique, timing and what is to many young students really important, speed. For best results follow the instructions the step by step advanced course offer. These video lessons are merely the starting point. To preview the video lessons, visit advanced chromatic exercises. 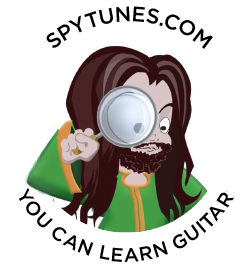 There are more chords to learn than the standard seventh note chords when you play the advanced guitar songs in the course. On this page, you’ll find video lessons for how to play the add9, sus2, sus4, 7sus4, 6 and dim7 chords. Sounds complicated but you’d be surprised how easy this language is. 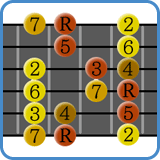 A 6 chord, for example, is simply a major chord with an added 6th interval. In the advanced course, we go into more detail about how to build these chords. 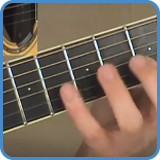 To preview the video lessons, go to more chords. There are another fifteen rhythmical exercises to get your teeth into on this page. You won’t need to spend much time with these and once completed, you can develop them and even write your own exercises. 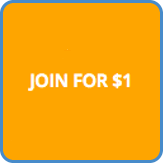 You’ll learn more about developing exercises when you take the advanced course. 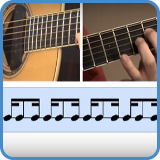 To see the video lessons already now, go to advanced rhythmical exercises. 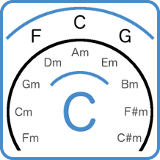 In the advanced course, we learn the all those scales called modes. That’s Ionian, Aeolian, Lydian etc in great depth. You need to first learn them in all shapes before you connect them up and down the neck. To completely master a modal shape, we finally run it through the cycle of 4th. Of course, there is no point in playing any scale if you can’t apply it, so in the course, we use real musical examples from famous songs. To preview the scale video lessons, go to advanced scales. Once your intermediate studies are complete, you can easily add all modes and arpeggios to the advanced SWS. All chords are still organized in the same way, the same system simply extends to include modes and arpeggios. There may be twelve keys but they all work in exactly the same way. Use the advanced songwriters swivel to keep track of them all.